From the above analysis, one important conclusion follows that it always takes time for the supply to adjust( (ully (0 the changed conditions of demand. 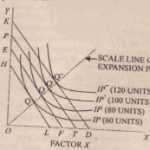 The reason why changes in supply conditions take time to adjust themselves to the changed demand condition is that the nature of technical conditions of production is such as to prohibit instantaneous adjustment to a changed demand condition. A period of time is required for changes to be maul’ in the vizc, scale and organisation of finns as well as of Ihc industry. It is because of the response of supply over a period of time to a sudden and a once-for all change in demand that economists find it useful and important to study the pricing process in the market period or very short-run, (b) Tn short-run. and (d in the long run, depending upon whether supply conditions have time to make (i) no adjustment. (ii) some adjustment of labour and other variable factors. and (iii) full adjustment of all factors and all costs.